My first time dining over at Sango Japanese Restaurant, and I'm already liking the Japanese fares there. Located on the second floor of Crystal Crowne Hotel in Petaling Jaya, they've been around for quite some time already, and serve really nice noms. 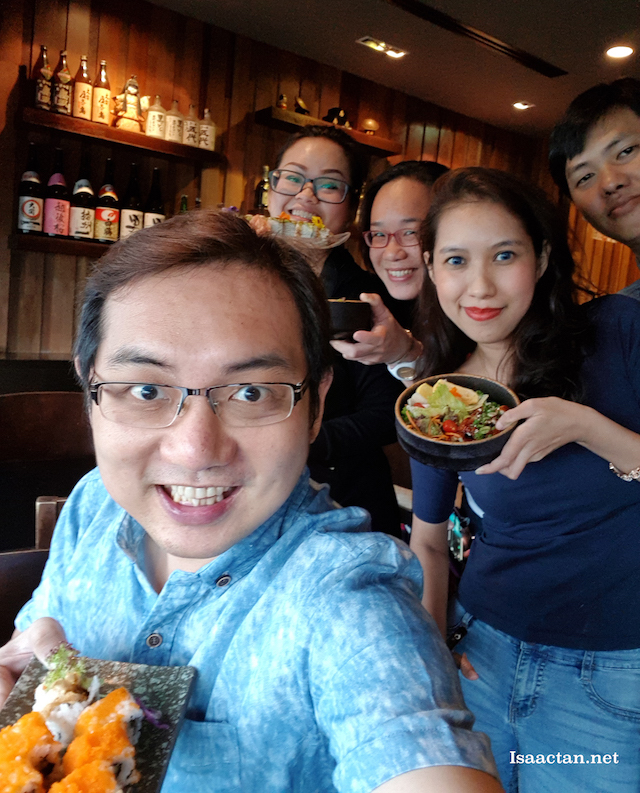 Check out what we had that weekend afternoon, from yakitoris, teppanyaki, to soba, sushi, and many more yums. Business hour: 11am-2.30pm (lunch) 5pm-10.30pm (dinner) daily. Special thanks to Mr Andrew from Sango Japanese Restaurant and Racheal from Foodilifecious for this wonderful weekend lunch invitation. Lots of love! Life's good, check out all these good food! 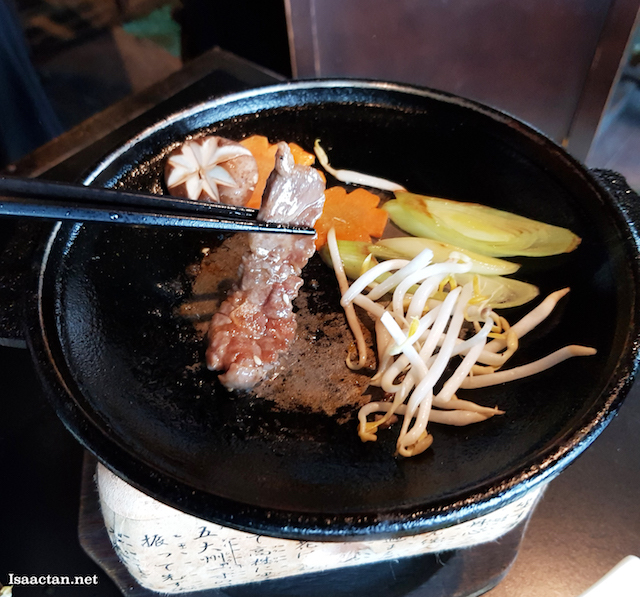 We kicked off our meal with some dishes from Sango Donburi Lunch choices. Newly launched, it's real value for money, plus they are delicious to boot. The Sango Donburi Lunch Set comes with Soup of the Day as well as 1 Scoop of Homemade Sango Ice Cream. Check it out below. I'm always a fan of sliced beef, or any beef for that matter. 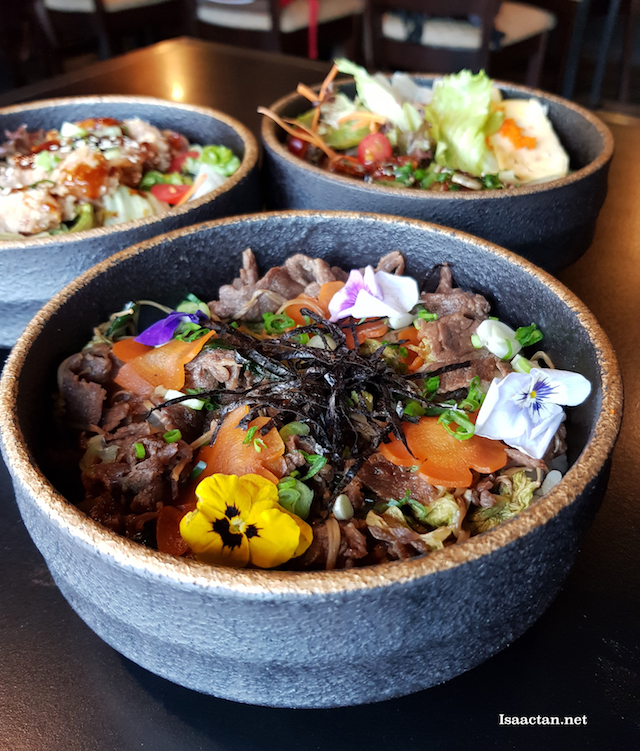 The Gyu Don came served in a rather pretty bowl, filled with steaming rice, and my favourite sliced beef with sweet onions on top. It's good, tasty, with lots of flavour. There's even this cute 'flowers' thingy on it. Take your usual chicken katsu, add loads off egg inside, and you have this superb dish, the Chicken Katsu Tamago Don . I actually liked this dish as much as the beef one, which is pretty surprising as I do like my beef. 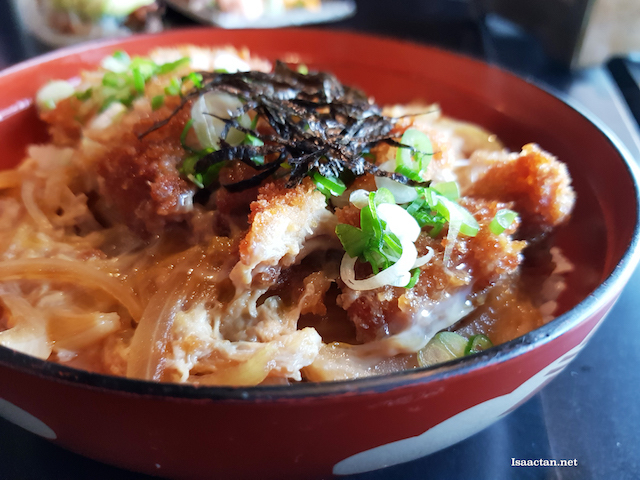 The katsu chicken is good, with loads of eggs and sliced onions thrown into the mix doused in dashi sauce. Tempura and shrimp lovers will do good to order Sango's Ten Don. 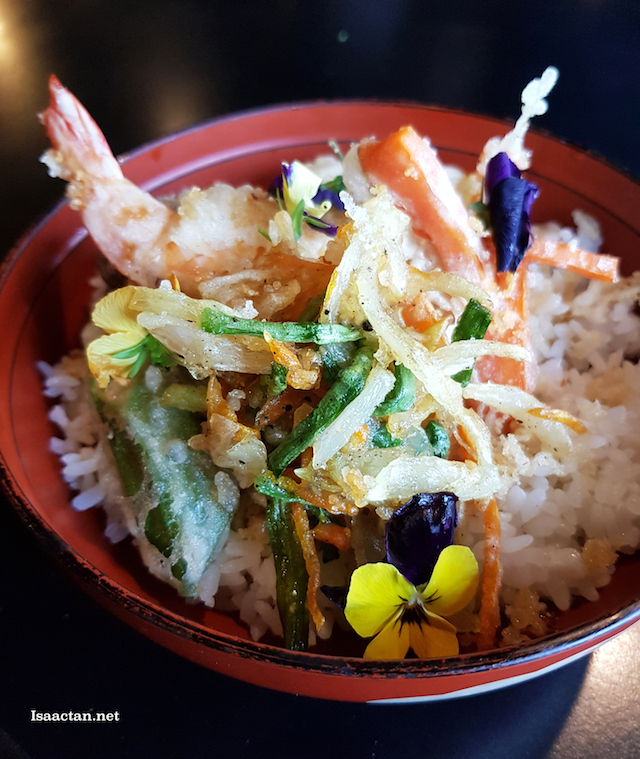 Doused in sweet teriyaki sauce, we have these fresh crispy shrimps and vegetable tempuras atop a hot bowl of Japanese rice. One serving of this is enough to fill one's tummy up real good. 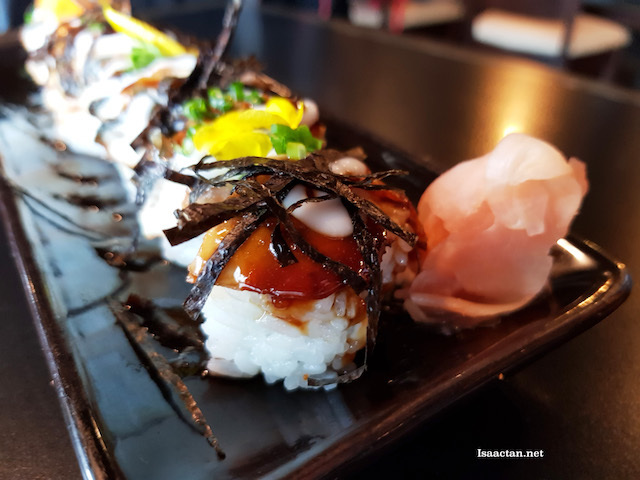 You must go for their unique Caterpillar Maki if you're here at Sango. 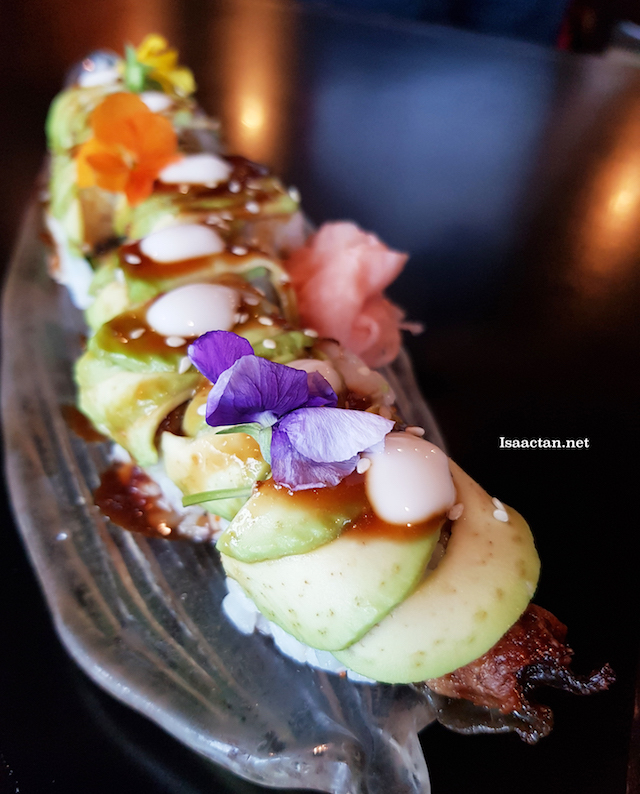 Made to look like a caterpillar, the sushi roll has avacado toppings, atop some really nice sushi rolls. 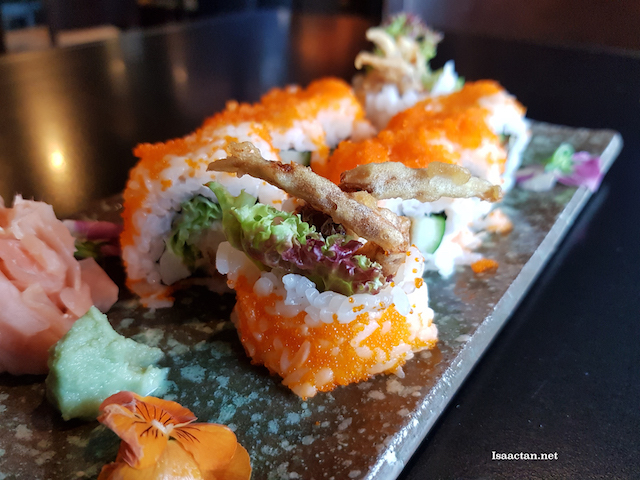 If you like soft shell crabs like me, then there's even a maki for you! Unagi lovers! There's a whole lot of unagis on this rather generous serving of maki on the uniquely named Dragon Maki. Pop one, two, all into your mouth and savour all that goodness! Did someone mention shabu shabu? 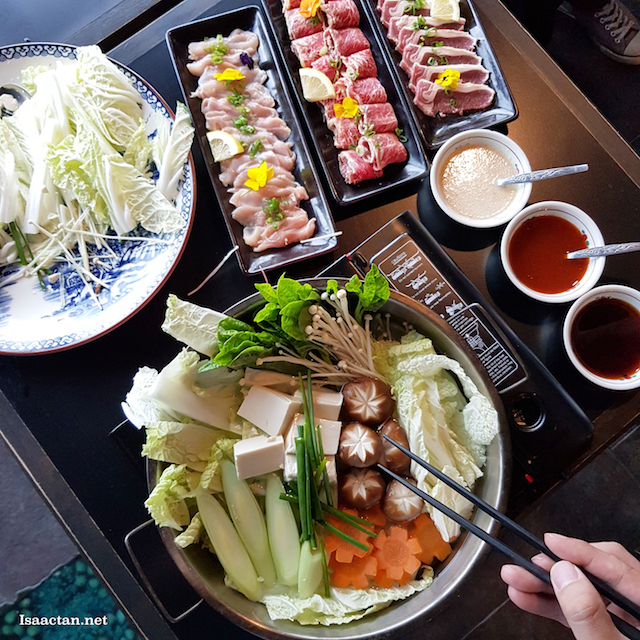 Oh, it's been a while since my last shabu shabu feast and I was elated to have really good meat at the table that afternoon at Sango Japanese Restaurant. We had all three meat, chicken, lamb and beef! (Sango's a pork-free restaurant) Dip it in the flavourful pot of soup filled with loads of vegetables, tofus, and a variety of mushrooms. I can literally smell the flavours! Save the best for last? Heck, this isn't even the last dish , but definitely my favourite! 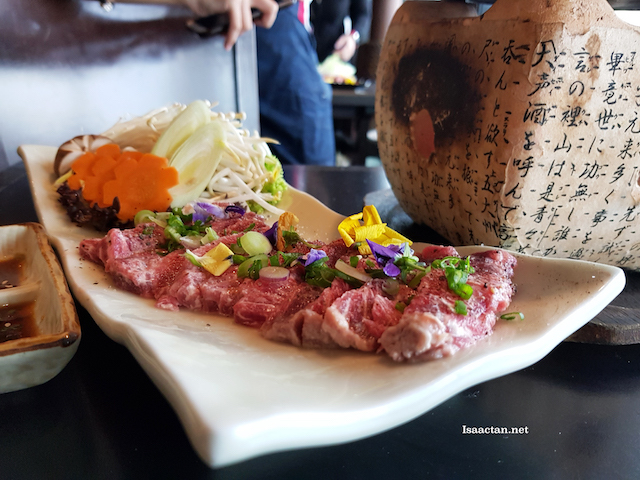 Wagyu Tobanyaki, we roasted this really tender and soft wagyu over a ceramic plate, too good. I could literally smell the charcoal underneath, and when I bite into the meat, it was heavenly. I just could not get enough of the meat. 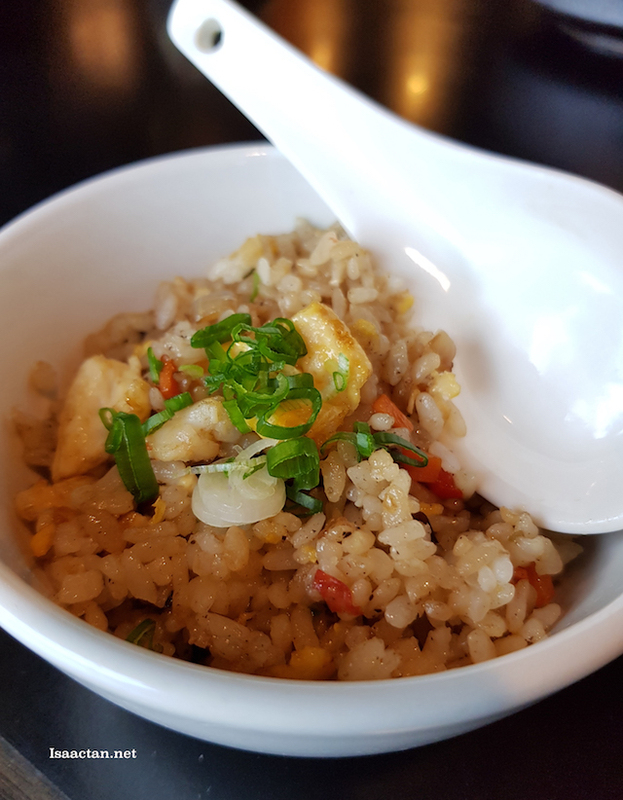 One bowl of Seafood Teppanyaki Fried Rice for everyone! 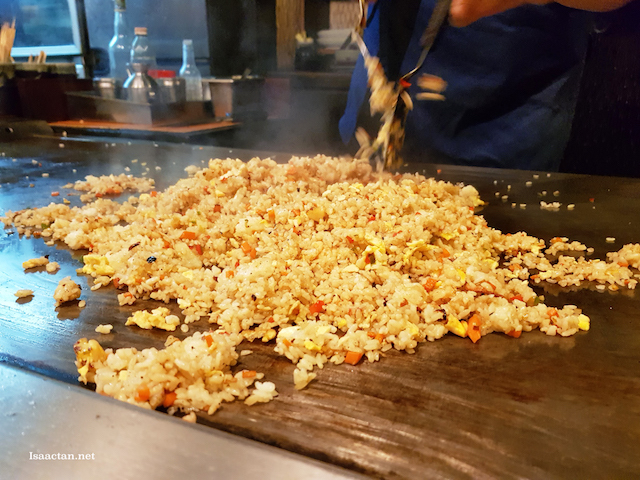 Prepared by the talented chef in front of us, we got Seafood Teppanyaki Fried Rice to savour that afternoon as well. You could really taste the ingredients inside, but it needed a tad more flavour for my liking. Nothing a dash of Japanese soy sauce can't fix. More beef? Yes please! If you don't know yet, I'm a super big fan of beef. 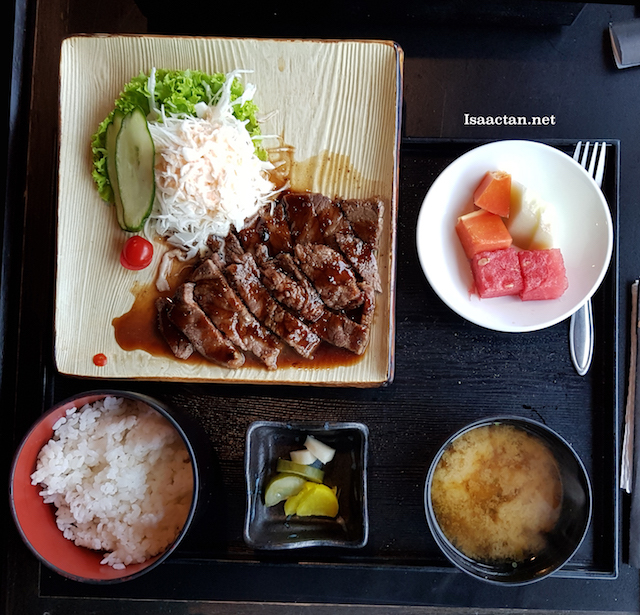 Here, the Beef Teriyaki Set is done perfectly, with lots of flavours from each bite. The set comes with miso soup, a bowl of rice, complete with fruits and all. Lovely cutlets of beef, I like it. There you have it. 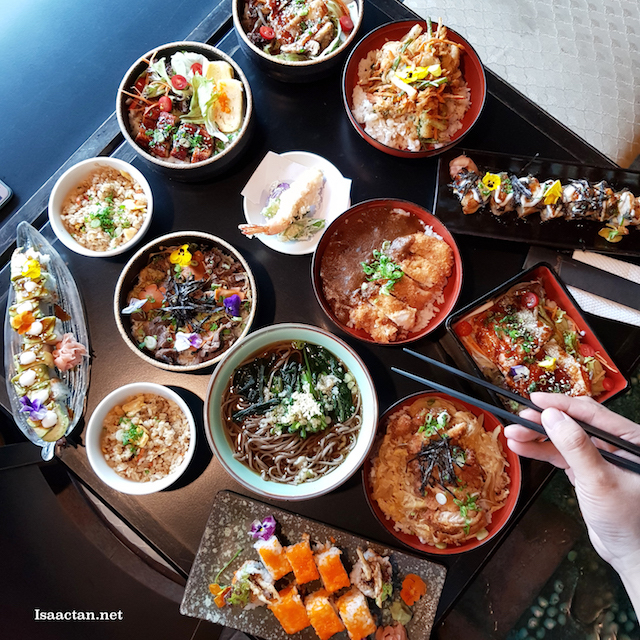 The next time you're in the mood for some really good Japanese cuisine, drop by Sango Japanese Restaurant @ Crystal Crowne Hotel, Petaling Jaya and savour their fares. They are open daily from 11am-2.30pm (lunch) and 5pm-10.30pm (dinner). Hi! I see Cleffairy! Hope your folks back in Penang are ok, not affected by the horrendous storm and flood. The price is quite reasonable yeah. I might go there to taste all the wagyu - wait for me! You seriously wanna make me break my diet today. Food look super duper delicious. I love Jap food. nice place to dine with friends. shall buzz my dear to go this place soon. The lunch set priced very reasonably, food looks so good, especially the meat slice for shabu shabu. Oh these Japanese foods are tempting. This Sango Japanese Restaurant looks so interesting place, Would love to visit there with my family. I'm sure they will love the foods there! I can't eat beef. Reading this post makes me see what I am missing in life. Haha! Sango Japanese Restaurant is on my list of food places to check out during my next trip down. Omg delicious. Make me tempting to try out the Japanese Cuisines now. will add this to my list!